Joy Creek Photo Archive (c) all rights reserved Pulmonaria 'White Echo' is a Joy Creek Introduction for 2016. 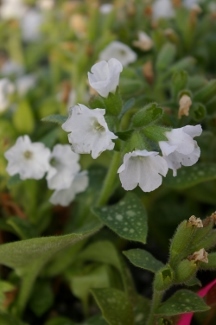 Over the years, we have raised several white-flowered forms of Pulmonaria officianalis, but, unfortunately, they have not proven to be long-lived. That is a shame because they are quite beautiful and are frequently requested. Four years ago, however, we found our first white-flowered seedling that has come through bitter cold, drought and even the predations of deer undeterred. We enjoy the way the cupped white flowers are echoed in the silvery white markings on the leaves, an effect which gave rise to the name. Late winter to early spring. 12 in. x 24 in.